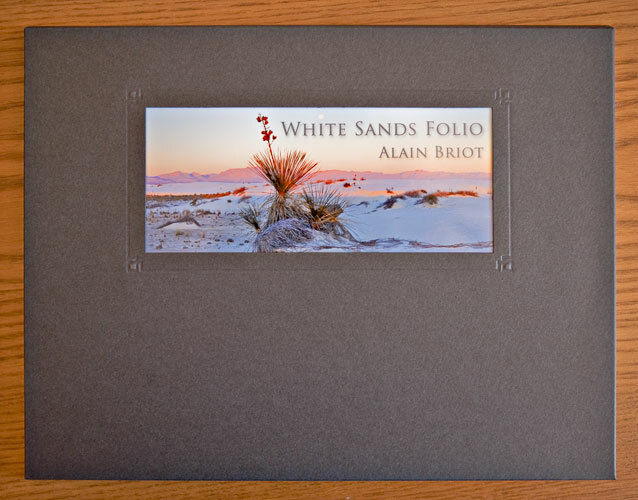 The 86th Alain Briot Print of the Month is actually not a single photograph but a Fine Art Folio, a collection of 12 photographs from White Sands National Monument in New Mexico presented in a Custom Folio enclosure. The photographs were taken over a period of 10 months, ranging from 1999 to 2009. 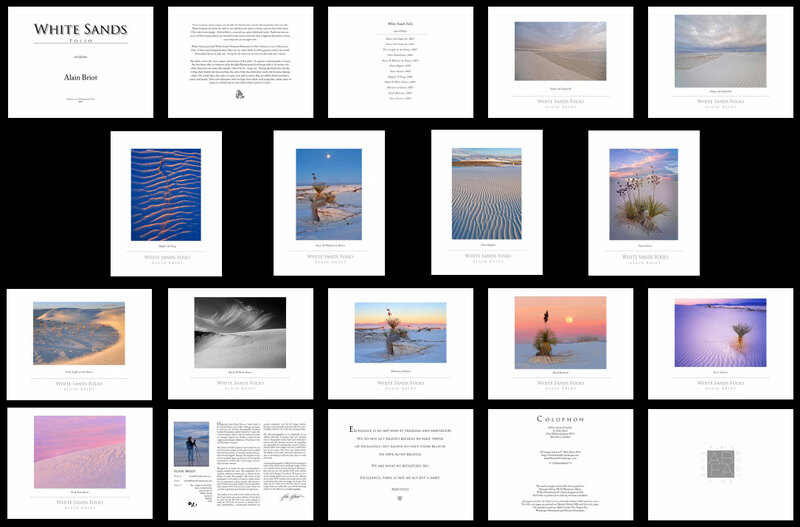 In addition to the 12 photographs, the White Sands Fine Art Folio features a Folio Title Page, a Photographs Title Page( listing the titles of the 12 photographs in the Folio), a Project Description Page, an Artist Statement, a Collophon (a project summary) and a Signature Page. 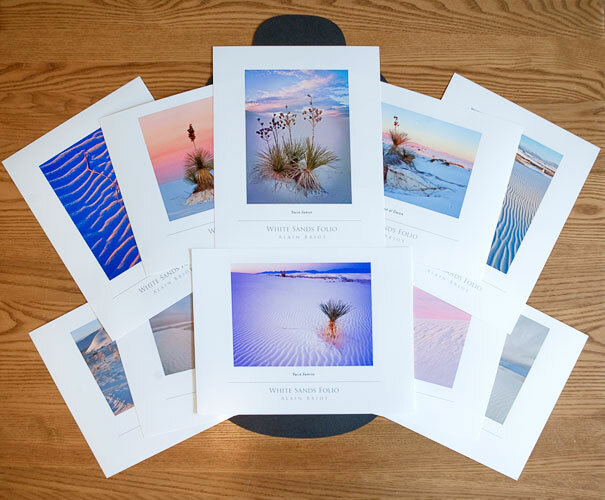 The White Sands Fine Art Folio is published in a numbered edition of 50 copies only. Since I only number my portfolios and folios, this is a rare opportunity to invest in a numbered edition of my work. Each Folio is individually numbered and signed by me. The price of the White Sands Folio is $475 .This price represents a substantial saving for a unique collection of images. Sold individually, this collection of 12 Fine Art Prints would sell for well over $1000. A PDF version of the White Sands Folio is included with your order at no extra cost. This PDF version is compatible with Macs and PCs, and with the Apple iPad. The PDF version is also instant gratification because you will receive a download link immediately after placing your order. 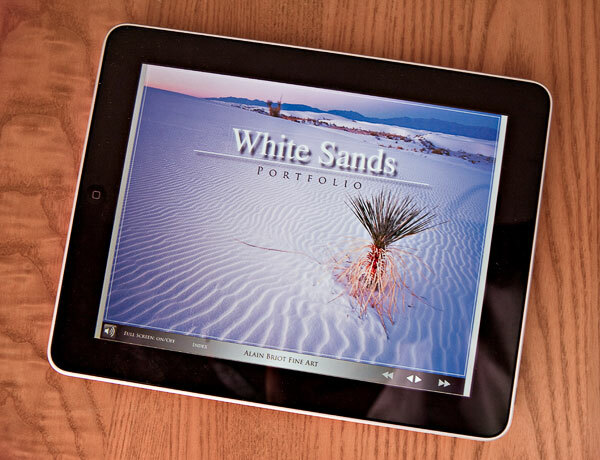 You can download the White Sands Folio PDF from there right away, and enjoy viewing it on your computer or iPad. Instructions for viewing on iPad are provided at the download link you will receive when you place your order. A Folio is a collection of photographs presented in a folded cover paper enclosure. The paper size for both prints and text is 8.5" x 11". The cover paper used for the enclosure is Oxford 100lb Cover. The paper used for the text is Oxford 80lb Text. Finally, the paper used for the Fine Art Prints is Harman Crystaljet Luster. 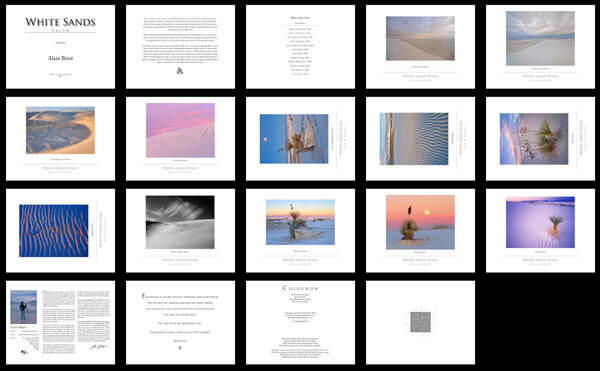 Below are photographs of the White Sands Folio contents. Click on the image below to open a larger version. For US orders, shipping costs are included in the Print of the Month price. US orders are shipped via US Priority Mail insured and trackable. Each package is professionally packed and insured for its full value by us. We guarantee that you will receive your matted or framed photograph in perfect condition or we will replace it. Simply contact us and return the damaged folio to us. We will ship you a new folio right away at no extra cost. All purchases are covered by my unique 100% Take one month to decide money back guarantee. If you are not satisfied with your purchase for any reason just return it (in original condition) for a refund or credit. Take one month to decide. Just make sure you return the entire Folio and its contents and that your package is insured and trackable. c) Order with PayPal by clicking on the Paypal button above.